Have you ever needed a little help opening a jar? Or holding a door? Or maybe carrying an item? We all could use a little assistance sometimes and in various settings - at the gym is no different. In a fitness setting, sometimes adaptations need to be made in order for us to execute movements safely, effectively, and without pain. Equipment is not built to be usable by every variation of how a human body is built or the way one moves. Good news: Numerous options for movement adaptation exist at the DAHLC! One option includes grip assistance for anyone who may benefit from additional grip support while holding equipment through a movement. 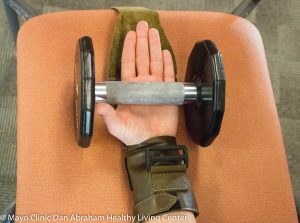 Grip is a crucial consideration when adding resistance or movement to the human body. 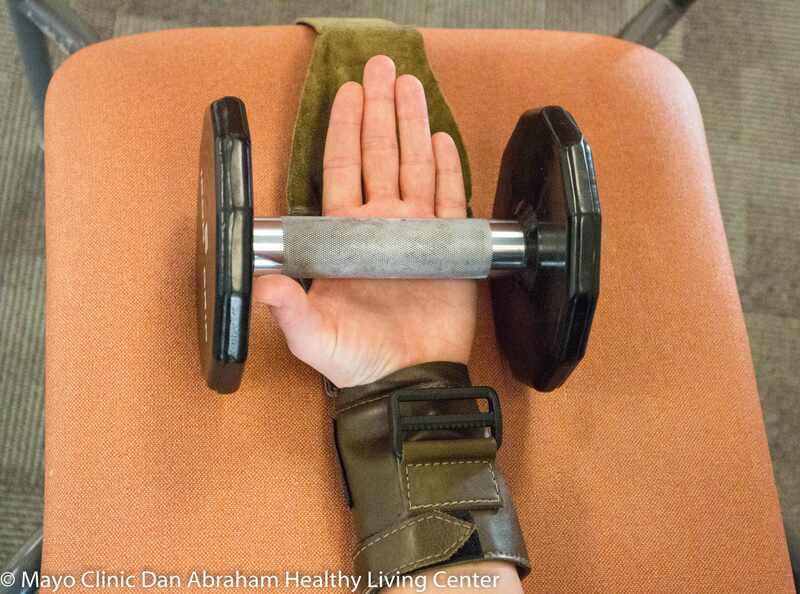 Reasons for using grip assistance vary, too: Some exercisers use weight-lifting gloves to provide extra safety when practicing heavy weight training; others may want to protect their hands from rough callouses. Still others may need the security of grip assistance provides in order to successfully maneuver. Safety and security through execution of a movement while maintaining hand control on the weight can be overcome with the use of a grip assistance activity mitt. This adaptive device is used to stabilize your hand and fingers in a grip position around the object you plan to lift or pull. Ask a Health and Wellness Coach to show you where the mitts are located and how to properly secure the mitt to the equipment you use. 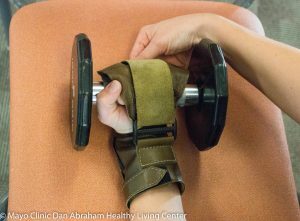 Learn more information about the "Activity Mitt", or assistive glove. Stay tuned for more information about adaptive equipment available at the DAHLC in future blog posts or email dahlchwc@mayo.edu.